(CNN) -- Sens. John McCain and Barack Obama weighed in Friday on the passage of the economic bailout bill, which was signed into law by President Bush. 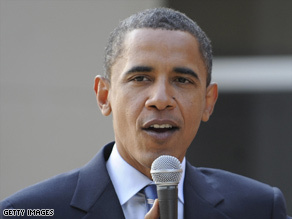 Sen. Barack Obama says the passage of the bailout bill "must be the beginning" of help for the economy. "This is not a moment for celebration, but a sobering day when we found out that three-quarters of a million jobs were lost just this year. Passing this rescue plan cannot be the end of our work to strengthen our economy -- it must be the beginning," Obama said in a statement. "America is facing one of the greatest financial crises in history, and today's passage of an emergency rescue plan was absolutely necessary to prevent an economic catastrophe that could have cost millions of jobs and forced businesses across the country into bankruptcy," he added. McCain, speaking in Flagstaff, Arizona, said he commended the House for "coming together to pass the economic rescue bill today. I am glad I suspended my campaign and went back to Washington to help bring the House Republicans to the table." "This rescue bill isn't perfect, and it is an outrage that it's even necessary, but we have to stop the damage to our economy done by corrupt and incompetent practices on Wall Street and in Washington. The action Congress took today is a tourniquet. It is not a permanent solution," he added. Earlier Friday, Obama and McCain released statements reacting to a jobs report that paints a dismal outlook for American workers. It shows that employers cut 159,000 jobs in September -- the biggest decline in five years. "Just since January, we've lost more than 750,000 jobs across America, 7,000 in Pennsylvania alone," Obama said at a rally in Arlington, Pennsylvania. "This is the economy that John McCain said -- just two weeks ago -- was fundamentally strong. "This is the economy that my opponent said made great progress under the policies of George W. Bush. And those are the economic policies that he proposes to continue for another four years." The McCain campaign's statement urged Congress to do more to help taxpayers. "Today's report of another 159,000 lost jobs confirms what America's working men and women have understood for months: Our nation's economy is on the wrong track. It is imperative that Congress act to address the financial crisis while protecting taxpayers and being good stewards of their dollars. But we must do more," McCain said. Also Friday, Obama took time out to praise Sen. Joe Biden: "I was so proud of Joe. ... America saw clearly why I thought he'd make such a great vice president, especially during these difficult and challenging times." The 30-second spot, called "Can't Explain," shows Biden's exchange with Alaska Gov. Sarah Palin over McCain's health care plan. Biden noted that McCain would pay for his proposed $5,000 tax credit to families with taxes on every individual with an employer-sponsored health care plan. The moment was among the more memorable ones in a debate that featured few knock-out jabs. Palin, a one-time supporter of the bridge project, did not respond to the line but was seen smiling. Tucker Bounds, a spokesman for the McCain campaign, called Biden's contention an "outright lie." "Oddly, instead of shying away from an outright lie told by Joe Biden last night, the Obama campaign appears willing to double-down on his reckless dishonestly. It's a lie for the Obama campaign to say John McCain's health care plan taxes health care, when the McCain plan clearly provides the equivalent tax break for every American. "Whether Barack Obama and his running mate are voting in favor of higher taxes on Americans making just $42,000 or telling bald faced lies, Americans know failed leadership when they see it." Bounds was referring to a June 5, 2008, vote on a resolution (Senate Concurrent Resolution 70) meant to outline the Senate's budget priorities through 2013, but the measure had no practical effect. Obama and running mate Biden voted "yes" on the resolution. McCain did not vote. According to a CNN review of the resolution, it assumes that most of the 2001 and 2003 tax cuts pushed by President Bush will expire in that time. That's what McCain calls a tax increase. However, the Democrats offered their own cuts in the 48-page resolution, which called for several tax cuts and breaks, including rolling back the alternative-minimum tax and the so-called "marriage penalty." According to an analysis by the independent Tax Policy Center, the tax plan Obama has proposed during the campaign would increase taxes in 2009 on the wealthiest 20 percent of households, while offering tax cuts for the other 80 percent. McCain, speaking in Pueblo, Colorado, on Friday, touched on the "underdog" status he now faces. "We have 32 days, who's counting ... between now and the election," he said. "My friends, have no doubt: I'm the underdog in this race, OK. I've always loved being the underdog." The Arizona senator also made a direct appeal to supporters to get out the vote. "I'm going to have to get you out to work. ... I'm going to count on your help. You've got to get out all of your friends -- Republicans, Democrats, Libertarians ... whoever they are. You got to get them out. And I'll be counting on you." Meanwhile, McCain's decision Thursday to pull out of Michigan prompted the state Republican Party chairman to issue a desperate plea Friday for donations to help fund political activities the presidential campaign probably would have shouldered. "I won't sugarcoat it; the McCain campaign's decision to pull out of Michigan is a tough blow," Saul Anuzis, chairman of the Michigan Republican Party, wrote in an e-mail fundraising solicitation to Republicans. "But we cannot let it deter us." The latest CNN poll of Michigan voters, released late last month, suggested Obama was holding on to his edge over McCain in the fight for the state's 17 electoral votes. Michigan has voted for the Democratic candidate in the last four presidential contests, though John Kerry's winning margin there over President Bush in 2004 was just 3 points.